I think everyone who went to my best friend Aimee's house in November or December would remember the big bowl of persimmons her mom had gathered. It was always sitting to the left of the fridge, looking so pretty. 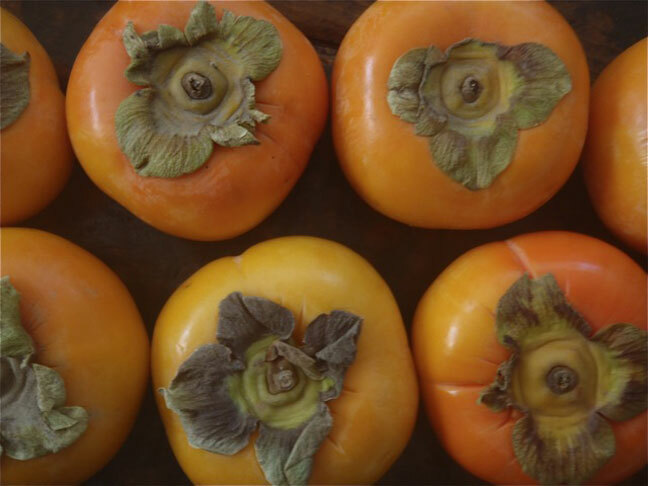 There are two common types of persimmons; Hachiya and Fuyu. Hachiya persimmons are extremely tart if they're not absolutely, supremely ripe. Ripe hachiyas are incredibly soft and have a silky smooth pulp inside. Hachiyas are typically used for baking, not eating on their own. Fuyus, on the other hand, are good when they're firm. Fuyus can be peeled, sliced, or bitten into, just like an apple. Their flavor is reminiscent of pumpkin and mango. Delicious! I've learned over the years many things that can be done with persimmons. Cakes, cookies, salads, the list is endless. 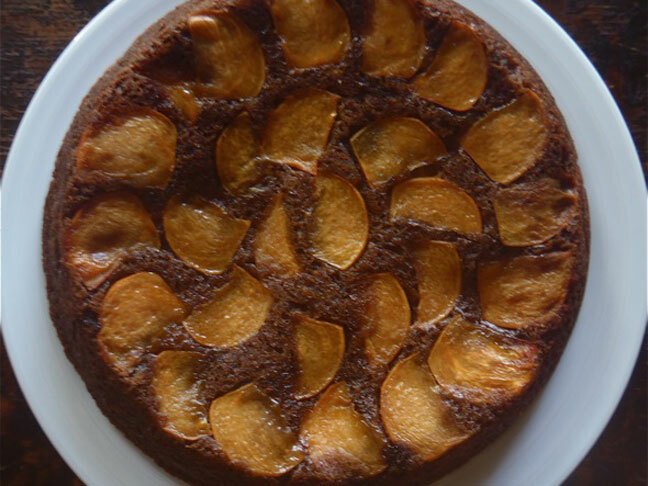 I found a way to use both Hachiyas and Fuyus in this recipe to make a stunning spice cake. My boys (ages 4 and 6), who I've mentioned are quite picky, love eating Fuyus persimmons. I've been slicing one to have as a side with dinner. Preheat the oven to 350 degrees and have a non-stick 9 1/2-inch cake pan ready. Place the butter in the pan and put the pan in the oven to melt it. Once it's melted, use a pastry brush — or just swirl the pan — to spread the butter evenly on the bottom and sides. 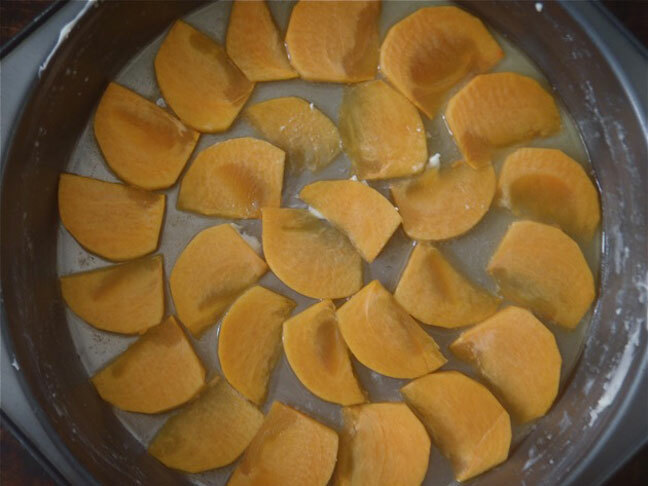 In a large mixing bowl, combine the Hachiya persimmon pulp, buttermilk, oil, vanilla, molasses, sugar and salt. Then mix in the egg until completely blended. Blend in the flour, baking soda and baking powder and mix only until combined. Lastly, fold in the remaining Fuyu persimmon slices. Gently pour the batter over the persimmon slices in the buttered pan and bake until the cake is solid, about 25 minutes. To invert the cake, wait for it to cool for at least 15 minutes. Then place a flat plate that's a couple inches larger than the cake, upside down on top of the cake pan. Flip it over and the cake pan should gently slide off when lifted. Voila! To remove the persimmon pulp from the Hachiya, simply cut it in half and squeeze the pulp out gently. 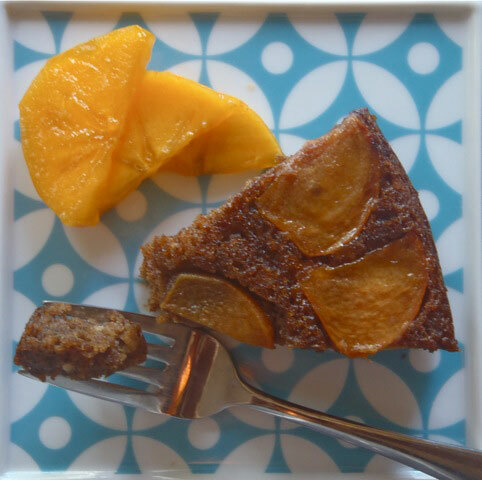 It's very important to use the right type of persimmon for each use in this cake — they are not interchangeable! And finally, a non-stick cake pan is essential here! Oh, and you might also like my Chocolate Persimmon tart.